Here are the last three quilt-as-you-go blocks finished this week for the Soy Amado charity quilts. These and my other orphan blocks have now been mailed off to Leila in Iowa, who will get them to Alison to be sewn together into quilts for street children in Mexico City. There are some wonderful, colorful quilts resulting from this block drive. You can check them out at Little Island Quilting. We did a little thrift store shopping last weekend. I found these Sigvard Bernadotte-designed china cups at St. Vinny's. They are smallish in size, a little bigger than a demitasse but smaller than a standard coffee cup. I think they may have been part of a hot chocolate set. Love the modern, no-nonsense design and functionality. They fit perfectly into the curve of your palm, great if you like to warm your hands the way I do. I'm guessing they were produced in the 1970s maybe (? ), by Johann Haviland, Bavaria, Germany. Lately, I've been serenaded at night by a newcomer to the neighborhood. "Hootie" perches in a tree just outside the house in the wee hours and starts making his presence known. It's fun to imagine he's trying to deliver a message, like Hedwig in Harry Potter, but he's probably just establishing his territory. If you believe in spirit animals, "When an owl shows up in your life, pay attention to the winds of change. Perhaps you are about to leave some old habits, a situation that no longer serves you or bring something new in your life." I'm too much of a realist to put stock in such things, but it is interesting to ponder. The winds of change I'd really like to feel about now are the ones that blow in warm spring weather. As owl calls go, his is fairly soft and soothing. (You can hear samples HERE). Although its repetitive nature means that about the time I nod off, he hoots another chorus. It could be worse. Just over the hill, about two blocks away, there was a barn owl last fall with the most blood-curdling scream. (Samples HERE) I would hear it in the evening just after dark as I took a walk. I don't know how anyone living in the vicinity managed with all the ruckus. But if they keep the population of furry critters down in my flower garden this summer, I'm good. Love your QAYG blocks, especially the blue & white one! Your cups are very pretty. A bit of warm cider in that cup would be perfect for me! And I loved reading about the owl in your tree. That is something you don't see every day. Maybe you could send a package to me via owl? I think the owl is cool, love urban wildlife! There were owls in the trees where my grandfather lived - my sister and I loved them (of course, we didn't SLEEP there). There's just something classic - retro - universal about hoot owls . . .
You cant go wrong with white coffee cups and dinner ware. The classics always look sweet! Love the final triumvate of blocks. How many did you make in the end? 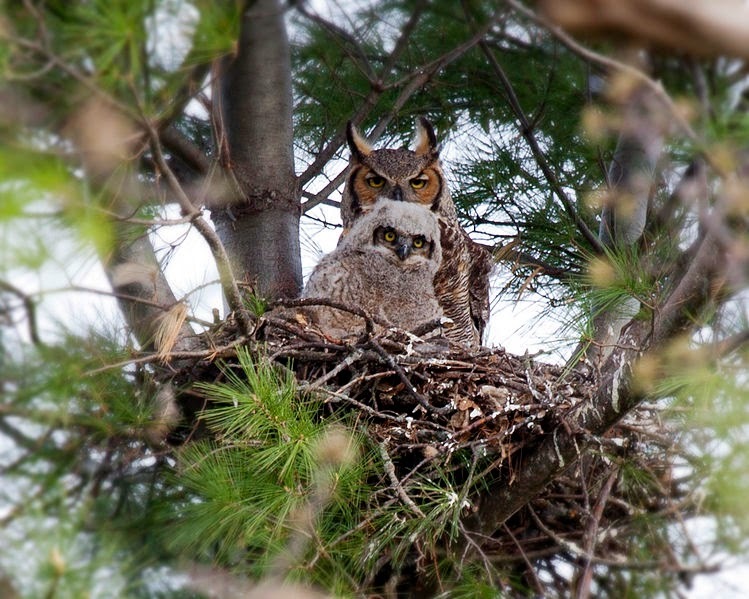 How cool to have an owl in your backyard. We do have owls here but I’ve never seen one in my own yard! your orphan blocks are lovely! I am wondering if the piecing is by machine or by hand. I love the fact you love thrifting, and antique malls! Great finds! I love hearing owls when I am out camping in the middle of nowhere!